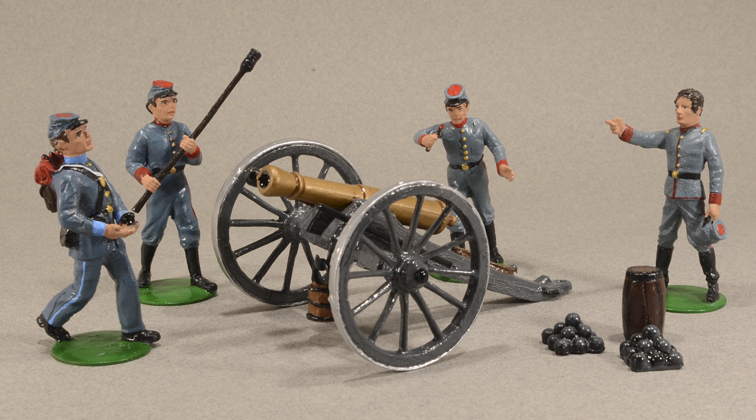 Boxed set with six hand-painted figures, an artillery officer and three gunners, Smoothbore Napoleon cannon, bullets, gunpowder barrel and accessories. 54 mm white metal set, assembled with tin welding; some figures may have small pieces of brass or copper. Hand-painted toy soldiers with glossy finishment, matt finishment by request. Not contractual photography to being a craftsman product. Hand made produced and painted in Spain. At the VINTAGE sets, some soldiers may have imperfections in the paint due to a chemical reaction with the protective foam.